RAVENOL Super Performance Truck SAE 5W-30 is a high-performance engine oil for commercial vehicles which can be used the whole year and which is adapted to the new exhaust gas emission rules (also for EURO I, II, III, IV and EURO V engines). 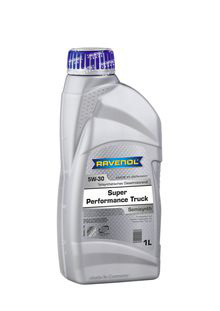 RAVENOL Super Performance Truck SAE 5W-30 is suitable for oil change intervals up to more than 100.000 km according to the manufacturer’s specifications. An excellent high temperature stabilit. Excellent detergent and dispersant attributes.